If you are new to acrylic pouring, or even completely new to art and painting then you might from time to time come across acrylic pouring terms that can really confuse you. A ‘dirty pour’ for example? Yuck! Why would anyone want to do that? I’ve tried to compile a list of acrylic pouring terminology and abbreviations, some of which apply to painting in general and some of which apply directly to acrylic pouring. If you have any other difficult words, terms or phrases that I’ve forgotten please let me know in the comments so I can add them. I’ll also appreciate any feedback on the descriptions below if you would like to help me write clear definitions. Abstract – art that does not attempt to represent external reality, but seeks to achieve its effect using shapes, forms, colors, and textures. Acetate – a clear sheet of flexible plastic often used to swipe one color over another to create cells in the paint. Archival quality – Refers to materials that meet certain criteria for permanence such as lignin-free, pH neutral, alkaline-buffered, stable in light, etc. ASTM – The American Society for Testing and Materials. An independent standard for certain paint qualities, adopted by most manufacturers. Binder – this is the substance that ‘binds’ a dry pigment together. For acrylic paints, Acrylic Polymer is the binder. Bleeding – describes the action of one color running into another. Canvas – cloth used over a stretcher frame or glued onto a cardboard to paint on. Can also be used as the term for the complete unit of the canvas fabric and the wooden frame. Canvas board – a heavy cardboard with a cotton or linen canvas glued to one side, with the edges folded over to the back. Sometimes also called a canvas panel. Color wheel – a circle with different colored sectors used to show the relationship between colors. Complementary Colour – The color that is directly across from a color on the color wheel. Complementary colors make each other seem more saturated and bright when placed side by side. They can also be mixed together in various amounts to unsaturate each other. (eg. red and green, purple and yellow, orange and blue). Dimethicone – a skin-safe form of silicone oil, often added to acrylic pour paintings to assist in the creation of cells. Easel– a wooden or metal stand for holding a canvas, a panel or a drawing-board. Gel medium – a semi-solid material that you can mix in with your acrylics to drastically change the texture, consistency and can make your paint go a lot further. Gesso – Used to prime the surface of the canvas and seal it so you can paint on it. It is a combination of chalk (Calcium Carbonate) and an acrylic polymer medium latex. Gesso increases the tooth of the surface, giving the paint something to grab onto and stick. Usually white in colour, as Titanium White is included in the mixture. (This is why all stretched, primed canvases are usually pure white). Gloss medium – medium that you can mix in with your acrylic paints to add shine to the paint or use to varnish the surface. Intensity – The purity and brightness of a color. Also called saturation. Interference paint – when viewed from different angles the paint appears differently. Painted over a dark color you can see one colour, paint the same colour over a light background and you see the complimentary color. Add a very small amount of black to Interference colors to produce deeper, richer, opalescent effects. Lightfast – Resistant to fading or other changes due to light. Matte – flat, nonglossy; having a dull surface appearance. Variant spelling – matt. Medium – the method in which an artist works; oil-painting, gouache, pastel, pen and ink, etching, collage, sculpture, etc., are all media for his expression. Mixed media – one or more medium used in the same picture. Opaque – a pigment that doesn’t allow light through, as opposed to “Transparent” which is the opposite, and does let light through. Palette – the surface that you mix colors onto, this can vary from wooden palettes to glass, to tear-off paper palette. Acrylics, due to their fast drying nature, benefit from a stay-wet palette. Can also be used to describe the range of colors you are working with, i.e. I’m working with a palette of earth tones in my next work. Permanence – The ability of the paint to retain its original colors through time. Most acrylic paint colors have high permanence except for wild synthetic colors like neons. Pigment – the raw material that all paints are made from. Natural or synthetic materials are finely ground and mixed with a liquid binder into a paste to make paint. Pouring medium – an additive to your acrylic paint, designed to (usually) keep the paint wet and workable longer, and promote it to better flow and move. It may or may not ‘thin’ the paint depending on the product used. Examples might be the Liquitex Pouring Medium, Floetrol, GAC 800 or PVA Glue. Puddle pour – a technique where acrylic paints are layered on top of each other in several ‘puddles’ before the canvas is tipped to create interesting designs in the flowing paints. Resin – a type of clear, glossy protective finish sometimes added to poured paintings to bring back the vibrant color of the paint and give the painting depth. Also described as epoxy, this two-part product produces a chemical reaction when mixed and eventually hardens (or cures) to a clear plastic durable finish. See our of the Best Resins for Acrylic Pouring here. Silicone oil – an oil product added to the paint to encourage the formation of cells. Often heat will be applied with a chef’s torchto create additional cells once the design has been created. Swipe / swiping – the process of dragging acrylic colors across each other to mix them and encourage the formation of cells. Torching – where heat is quickly flashed across the surface of a painting while the paint is still wet. This is often carried out using a chef’s torch and serves two purposes. It will pop any air bubbles in the paint and also encourage the formation of cells. Transparent – The color is slightly see-through, allowing light to penetrate it. When applied over other layers, some of the layers underneath will show through and will be visually mixed by our eyes with the transparent layer on top. (Eg. laying transparent yellow over a blue layer will visually read as green to us). This is the opposite of an opaque color. Varnish – generally, a more or less transparent film-forming liquid that dries into a solid film. Yupo paper– an alternative to traditional art papers. It’s a synthetic paper, machine-made in the USA of 100% polypropylene. It is waterproof, stain-resistant, and extremely strong and durable. I hope you found this glossary of acrylic pouring terms useful. Share it with your friends and PIN it to your painting boards for later. Don’t have any painting boards on Pinterest yet? 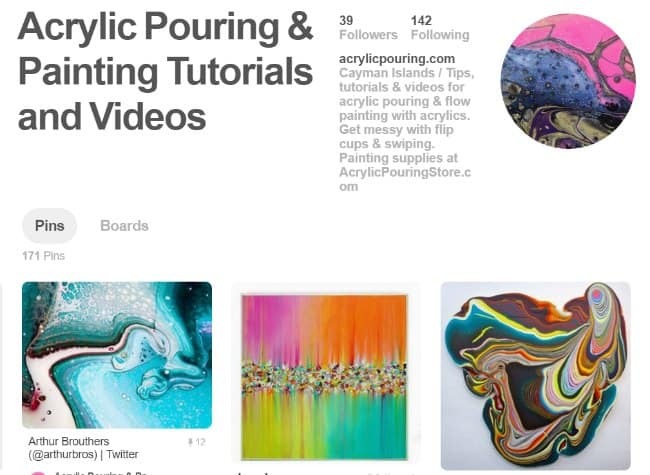 Why not start by following the Acrylic Pouring Pinterest boards here. I have a question……on a YouTube video the instructor said she used diy pvd by mixing Elmer’s glue with water. As a beginner wanting to try to keep the price down would you recommend you this.if so what proportions would I use? I’ve only tried it once and the results were OK. I’ve heard that 3 parts glue to 1 part water is a good starting point. Add this to the paint at about 20-30% of the paint by volume then any additional water as necessary. I think it would be OK for testing and practicing, but wouldn’t hold up well long term. Thank you so very much for this great dictionary of fluid Acrylic pouring art terms. I am a beginner. I am experimenting at this point. Could resin be added? That process is a mystery to me still. I love to see the completed effects. Its combustible nature is scary. Some tutorials I’ve seen have mentioned using a primer on the canvas to start with…do you recommend that? Is it necessary? The camvases I use tend to be double primed when I buy them so I don’t usually add anything else. I actually like the texture of the canvas to show through in the finished paintings somewhat. If you were using a dollar store canvas, or reusing one you had painted on before, then yes, there would be no harm in giving it a coat of gesso or even a quick coat of base paint before you start. I am a total beginner and all of these terms really helped with understanding the process. Thank you, I’ll be reading more on here and look forward to new information. I haven’t made a start yet. I joined in order to learn as much as I can about how to produce such incredible works of art using this method. I can’t wait to gather supplies and get started. So glad I found this site and grateful for all the information. How long does it take for these to dry? Can a heat gun be used instead of a chefs torch? Drying depends on what surface you are using, the thickness of the paint and the temp/humidity of the drying area. And also what you mean by ‘dry’. Dry enough to move – 24 hours. Dry enough to touch – maybe 3 days. Dry enough to varnish – maybe 10 days. And yes you can use a heat gun but they can move the paint around a bit more than a torch so it depends on what you are looking for it to do. If I don’t like my results can I do another pour over the first one? Yes and no. Make sure it is fully cured for at least a month then give it a couple of coats of gesso. It’s usually fine but I’ve had a couple where the paint has cracked or lifted so you will take a chance with it. Better to try to decide when its wet and wash off the canvas if you can, but I know its hard to make that decision before its dried sometimes. Thank you so much for this site. I am addicted to flow painting as I get pleasure from the results. I to am a beginner in acrylic pours, am profiting from all the tutorials and want to know when I can progress to more expensive paints and how much of a difference can I expect in the quality of those paints. I’ve never used any artist quality acrylics in my work so I couldn’t say if more expensive paints made a difference. Perhaps they include more pigment and you could get a brighter result without the paints darkening when they dry, but in all honesty I don’t know. Are you in our Facebook group? This would make an interesting question there and with more than 10,000 members I’m sure someone would be able to advise you. What is the name of the Facebook group? I am very interested in this process. This site has been really helpful. Thank you for explaining so clearly. Makes me happy to know you found it useful, thank you. Great list of terms, very helpful in moving on, I have just started, and I am hooked! Did not even think I liked abstract-I was wrong!! I think when you start to appreciate it, you see that it is really not that random, it has a grace and style all of its own. I have a video coming out for this on Saturday. If you get the newsletter it will come to you then, or remember to check back and watch me have some fun hitting paint! I’ve just started and feel obsessed! BUT so many mediums are American and it’s difficult to find equivalents in the Uk-any ideas/names? Also is there a way of reducing the waste from each pour, apart from the obvious, don’t make too much! Our shopping list here does have some links for the UK, although Amazon is usually your best bet for finding the right products you need, or a local equivalent according to our group members. I also like to use my spilled paints for dipping, especially small tiles and canvases so very little is actually wasted. Always best to let it dry slowly and naturally. Trying to speed things up can lead to cracking. Thank you for your site, I find it very helpful! I have done three pieces and they look really nice. My questions are: I have only use opaque primary colors and white , do you use transparent and semitransparent colors, and if so, why if not why not? I guess what want to know is, are transparent and opaque colors used together with good results in a pour? Is stone one or the other? Is it one type of paint or can different types of paint be mixed in a pour? So long as they are all acrylic paints you can certainly mix and match brands within the same pour, but I wouldn’t add in paints of other types such as tempura etc. I don’t think you have to be overly concerned about having a mix of opaque and transparent. I did a pour here with just white and all transparent colors and it worked just fine. But having only white plus the 3 primary colors is really going to be difficult to paint with. Mixing primaries often makes muddy results. Hopefully you can find more colors to work with and be able to create a wider color palette in your art. I’ve just recently started cell pouring. I’ve done 3 canvases. They turn out beautiful, but my problem is they don’t have the cells. I don’t know what I’m doing wrong 🙁 I use student to artist quality paints, add a little floetrol to all of me colors, then add a little filtered water to each color, and then lastly I add a little silicone spray to each color. Then I do a dirty pour among other pours. The colors pour fine, but the cells don’t really come through on mine. The first time i added about 2 to 3 big sprays of silicone in each color, and since that didn’t work, last night I tried again and added much less silicone. Got the same results. What can I do to make big cells? Oh and I do torch it after also, and still nothing. Usually if you seem to be using all of the right ingredients and are doing everything right, then it either comes down to the ratio of ingredients is wrong or the paint consistency is wrong, or a bit of both. Are you in our FB group? If you come over and list out all of the ingredients you are using and in what ratio, and show a photo of your typical results we can try to diagnose the problem. It can also be helpful if you can show a quick video of your paint consistency. We’ll get you there! Thank you so much for explaining the terms used in pouring. I am so intrigued by how this works. Gathering my supplies on a budget, then deciding where I can do this in the house – that I can leave it to sit and dry – and no dogs will get to it! Joined the mailing list and got the beginners book. Hoping to do some pours next week. Thank you for putting together this newsletter, I’m brand new to Acrylic pouring and have found this extremely helpful. I create polymer clay jewellery pieces and was looking for a finish that was different and exciting. I have created 3 acrylic pours plus a flip cup and a dirty pour so far, which I loved. I have used the excess paint in the tray to dip some of my jewellery and the results are fabulous. The video’s and glossary are very helpful. I am a beginner in pouring but crafted and taught crafts for many years. This is something different I will be able to give a class to a combined class of Senior Citizens and children. Looks fun and do-able. Thanks so much for all your great videos and tips. I just started doing this a few weeks ago and my husband liked it so much that he has joined in the fun. We have both turned out some pretty awesome paintings and some ho hum ones as well. My question is why do we sometimes get big dips and crevices in the finished product? I don’t notice them until the canvas has dried. Although it does add some interest to the piece. Could it be bubbles? I am planning on joining your Facebook group. I have tried everything I’ve seen on YouTube too. Floetrol, Liquitex Pouring Medium, Silicone, Alcohol, Every Brand of Paint I could get my hands on, GAC, Mod Podge and I’m sure there are more! I only got tiny cells one time and by morning, they were gone and the painting was dried and cracked. I think I’ve never been so frustrated. I signed on here to get help with this, but I have a feeling I’m gonna be sent to Facebook! Why can’t someone just put out the correct recipe? Thanks! There is no correct recipe Tracy. Sadly there is no one recipe that works for everything and everyone, which is why you see so many people having success with vastly different recipes. It’s not that anyone is keeping it a secret from you. All the youtubers you watch will openly share their recipe. If you are following all these recipes that work for other people perfectly well and they aren’t working for you, then its not the ingredients or recipes which are at fault, its most likely that your paint consistency isn’t correct. It sounds like your paints are too runny, but its hard to diagnose without seeing, so yes, we do recommend you join the Facebook group and share some photos of your work so the members can see what’s going wrong and help you fix it. Great list and really helpful to someone like me starting out. 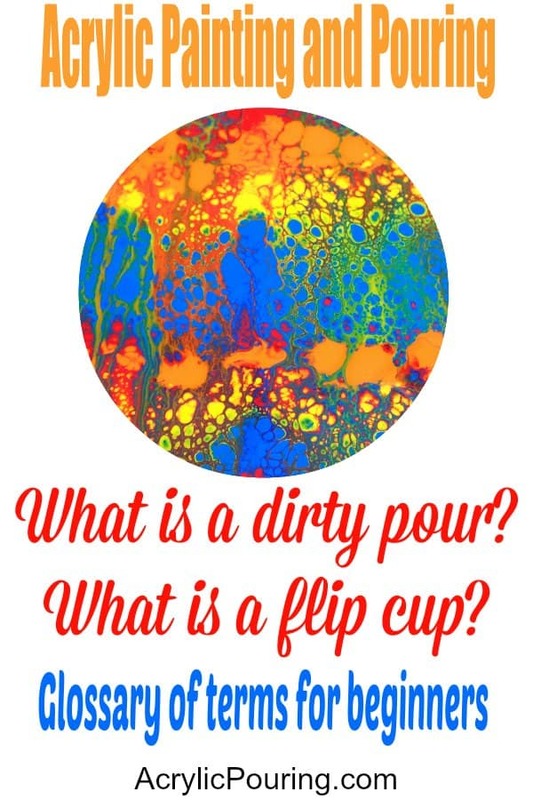 Lol, when I first heard of a ‘dirty pour’, I figured it meant it was a mess up, contamination or something! The only thing I would add to the list would be acrylic ‘skins’. I hate to waste paint that flows off, so I do catch it and reuse it in another mixed media project. Thanks for the great info. Great resource, thank you. I would also add ‘skins’, and I would add ‘cure’. My first attempt at pouring will be on Saturday. Will I get favorable results using 1part paint 1part Liquitex pouring medium +3 drops Silicone in an 8 oz. cup starting with white & than adding 3 other prepared cups of colors. Truly Patrice. That seems like a recipe that will work. Just be sure to pick colors that go well together and I think you’ll have a pleasant result. I’m definitely a beginner. I wish to start pouring & have been so intrigued with all the beautiful paintings you all end up with.I never thought I liked abstract until I started looking at these amazing works of art you all make! I’m a little afraid of messing up, but your instructions have certainally helped ease my mind somewhat, you explain things well & in language I understand. Thank You!.Now I just have to gather my supplies & find the time to spend at it so I’m not rushed.Very much looking forward to starting this amazing craft! I haven’t poured yet, but my son has some on his wall at his house. And I loved them. Going to try soon. My “Canvas Board” projects don’t dry flat. Any advice? Hi Lynne, I dont have a huge amount of experience with pouring bye to, but I have had the same problem as you. I am sure this a long explanation cor am simple action. Sorry. What I usually do after it is well dried is use a spray water bottle and lightly soak the back of the board. I Set two objects such as thick books apart from each other and lay the painting on them. Whichever side is arched faces up. I then place another object under the painting but slightly lower than the books. Place a heavy object on the center of the painting. This will gently force it to a flat position. Leave until it dries. I then lay it flat with a couple books on it for a couple days. Hope this makes sense and helps. Oh, store them flat also. Leaning them will cause arching.